The 8th Air Force ordered all of its groups to Germany. The 14th Wing drew an aircraft manufacturing facility at Oberpffaffenhofen. This was a Pathfinder-led mission, but we don't know who led it. Of the 22 ships dispatched by the Group, 2 of them had to abort. One had a mechanical failure and the other had a crewman injured. The number of escorts assigned to the 2nd Air Division was undersized, as 262 fighters were expected to protect 433 bombers. The mission planners hoped that they had the Luftwaffe figured out, but they didn't. 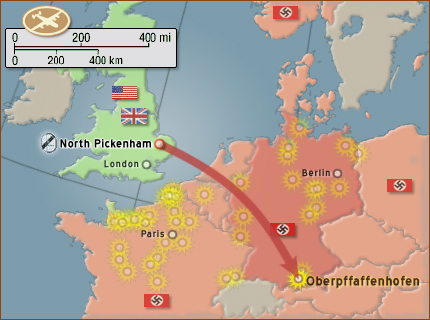 The 2nd Air Division lost 22 Liberators on this run as the Luftwaffe put up a fierce battle. Flak was reported to be fairly heavy and accurate and accounted for some of the 22 planes lost. Despite heavy flak, a relentless Luftwaffe and undercast skies, the target was attacked with rather good results. Wesson Crew R-33 was hit by flak over the target area. Their plane caught fire and one crewman was wounded. After they were able to put the fire out, they figured out that their crippled ship could not make the long trip back. They went to Switzerland. Walker Crew R-41 began having problems with two of their engines, when suddenly the tail turret quit working. Assumption is that their plane had been damaged by flak. They could see that the extra strain on the two good motors would burn too much fuel to make a return trip to England possible, so they went to Switzerland. The Group experienced another first. While the 2nd Air Division had been attacked by the Luftwaffe from all directions, the Group flew through it without being attacked themselves. For those flying in the front of the formation with a window seat, they helplessly watched another group ahead of them get attacked in the same manner as they were back on 7 July 44. Others within the Group had ringside seats to watch their sister group, the 392nd, lose 3 planes while fending off the Luftwaffe. It was the first time, the Group got to see a major air battle that they themselves weren't fighting. As horrendous as it was to watch fellow comrades go down, the ugly truth was that they were glad the Luftwaffe had picked on someone else for a change. However, the Group did lose 2 planes and its 9-man crews, but no one was killed. For that, they were lucky again.